The New York Times has an article today about Comcast using social media to respond to customer complaints. Comcast is definitely at the forefront of this move to engage customers out in the wild. Comcast’s efforts have previously been documented on ReadWriteWeb. 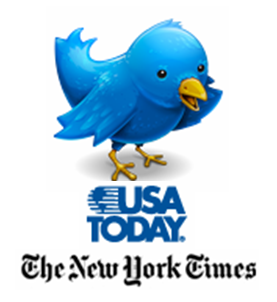 New York Times coverage helps move the concept, and Twitter, closer to mainstream adoption. What caught my eye in the NYT article is that some people are concerned about Comcast doing this. They feel like Comcast is acting like Big Brother. According to the article, 20 year-old Brandon Dilbeck blogged about his dislike of ads on Comcast’s programming guide. A Comcast representative found the post (Google blog alert perhaps? ), and responded to him via email. Hey dude! Your blog had some impact! Isn’t that cool? Mr. Dilbeck found it all a bit creepy. “The rest of his e-mail may as well have read, ‘Big Brother is watching you,’ ” he said. Here’s what I don’t get. Blogs are publicly available. Anyone can find a blog and comment on it. Sometimes, your blog posts result in actions you wouldn’t have expected. This is the power of Web 2.0. If you’re going to write publicly, how on earth can you be concerned about Big Brother? Sure, if Comcast had monitored his email or phone conversations, that’d be Big Brother (and illegal). I’m just getting tired of dopes buying into the surveillance of their personal history, daily activities and personal associations as a “convenience” – wake up people. Social media: If you write it, do it or video it, people can find it. That’s the great opportunity for all of us. The web contains vast amounts of information, but not everything worth knowing is on the web. An enormous amount of information resides in people’s heads: millions of people know useful things and billions more could benefit from that knowledge. Knol will encourage these people to contribute their knowledge online and make it accessible to everyone. As Mathew Ingram notes, Knol is compared to Wikipedia and Mahalo. Here’s how I’d break down the three services. Wikipedia is a collaborative effort toward creating a single information page. Mahalo is handpicked information created in a top-down fashion by experts. Knol is a bunch of separate blog posts on a given subject. 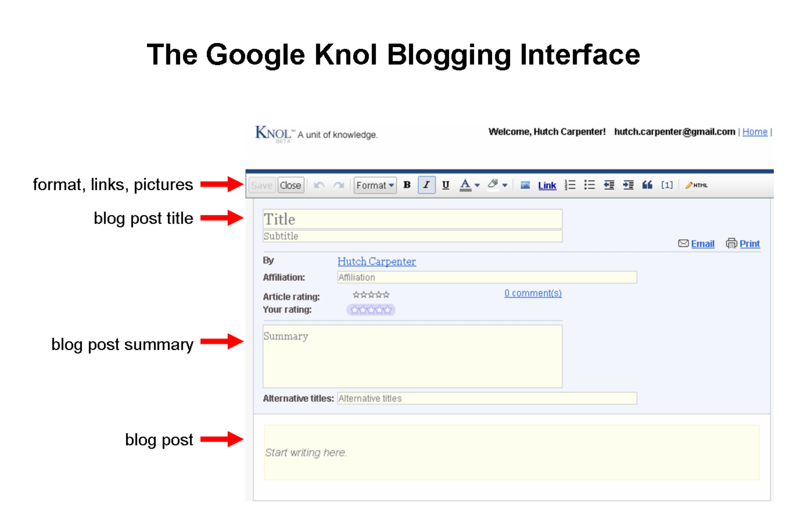 To find out more about Google Knol, I decided to write up a knol. My knol is Using FriendFeed to Increase Blog Readership. I took my old post Ten FriendFeed Visitors Beats 1,000 StumbleUpons Any Day, and got rid of the comparisons to StumbleUpon and Digg. The knol focuses on how FriendFeed is actually good for bloggers. The post was also (ironically) quite popular with Stumblers. So I cleaned up the references to other sites and added some things around attention optimization. Yup, I was ready to rock-n-knol. I thought there might be some sort of test to prove my expertise, or some approval period while someone checked my credentials. Nope. It was just another Google Accounts sign-up. Once I got in there, it was just like blogging. I wrote my paragraphs. Created section titles. Added graphics. I did assume a somewhat more professorial tone in the knol than I do here. So there could be knols that are set up as true community build-out efforts (#1 option above). That’s pretty much Wikipedia. The difference is that there may be several knols on a given subject – some by solo authors, some by a group of collaborators. Wikipedia has only a single page per subject. People can make comments on your knol. A good discussion can occur around a subject. This is just like a blog. An author can elect to allow ads to appear beside the knol. I did this, signing up for Google AdSense for the first time in my life. I don’t expect to earn a penny, but I want to see what ads run there. Blogs, of course, can also have ads. When you create your first knol, Google automatically creates a second one for you: your profile page (link to mine). A really nice feature that, again, is a hallmark of blogs (the About page). Aside from a bio, the profile page includes a listing of the knols that someone has written. What’s the Difference Between Google Knols and WordPress.com? The knol is the more scholarly of the two. But the wordpress.com blog holds its own in terms of information. Brand. Knol is branded as an expert/knowledge site. Blogs are that, but also include a lot of opinion and first-person experiences. Ranking. Readers can rate a knol on a 1-5 star scale. These rankings will help the best content emerge at the top of search results. Google knols may also have better “Google juice” than most blogs. Search Engine Land suspects knols will inherit a Google page rank advantage in search results. The key principle behind Knol is authorship. Every knol will have an author (or group of authors) who put their name behind their content. It’s their knol, their voice, their opinion. We expect that there will be multiple knols on the same subject, and we think that is good. Note the inclusion of opinion in there. Once you open that up, you’ve fundamentally got blogging. Knol might be good for people who don’t want to maintain a full blog, but would love to write a few articles providing knowledge and opinion. Go take a look at the knol I wrote (link). Please rate it. Comment on it. I’m curious what all that interaction looks like. And then go blog your own knol. If you do, leave a link in the comments so I can check it out.